Author Written by Mihaela Dinita and last updated on Posted on July 27, 2017 . This tutorial is part of our SAP FI course and it talks about SAP Clearing and Open Items in Financial Accounting. You will learn what are open items in SAP FI and why they need to be cleared. We will discuss different ways to perform clearing of open items in SAP ERP: SAP Automatic Clearing and SAP Manual Clearing. Our explanation will be illustrated by examples for customer, vendor, and G/L accounts. 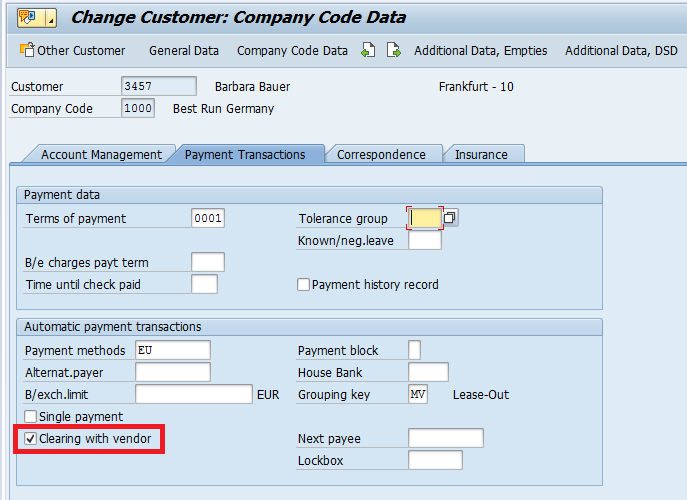 Open items in SAP are incomplete transactions (e.g., outstanding vendor payment or pending customer payment). 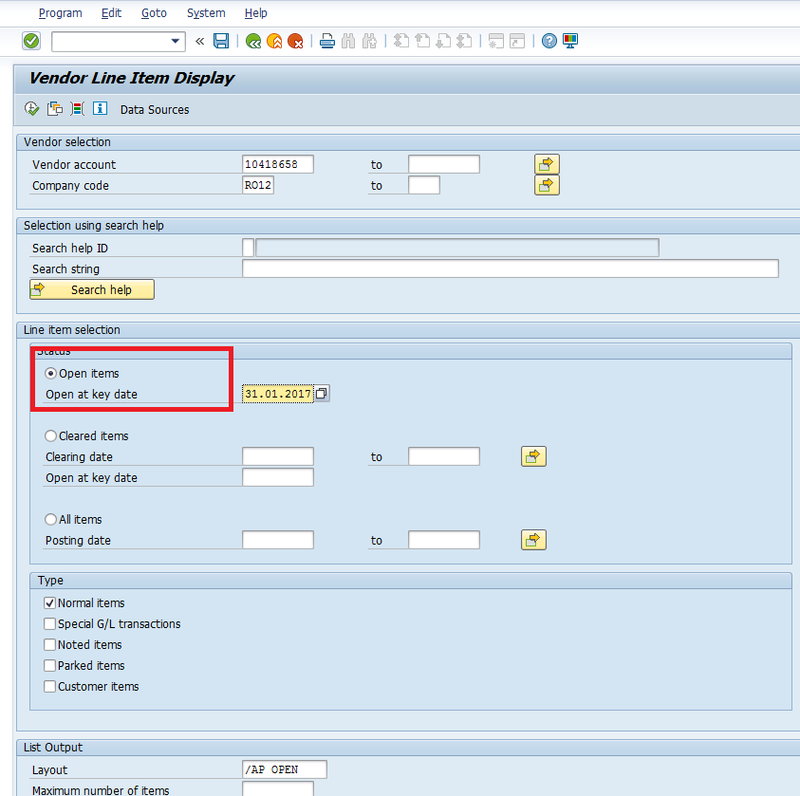 SAP FI documents containing open items are archived in the system after clearing. 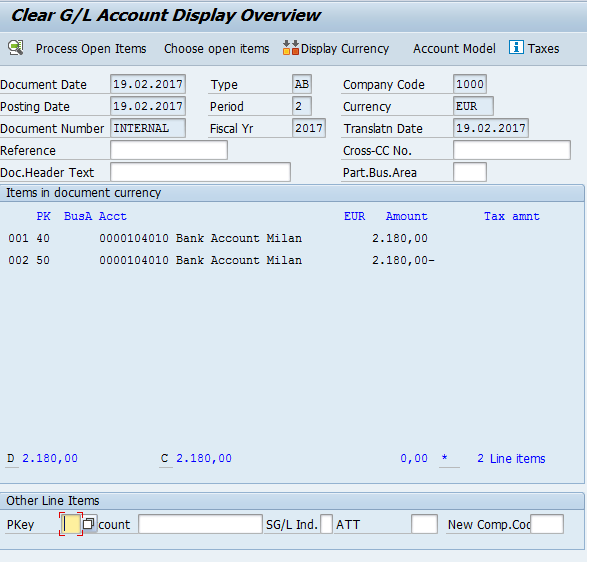 A transaction is considered cleared when an offset value is posted to an item or group of items, so that the resulting balance of the items is 0. 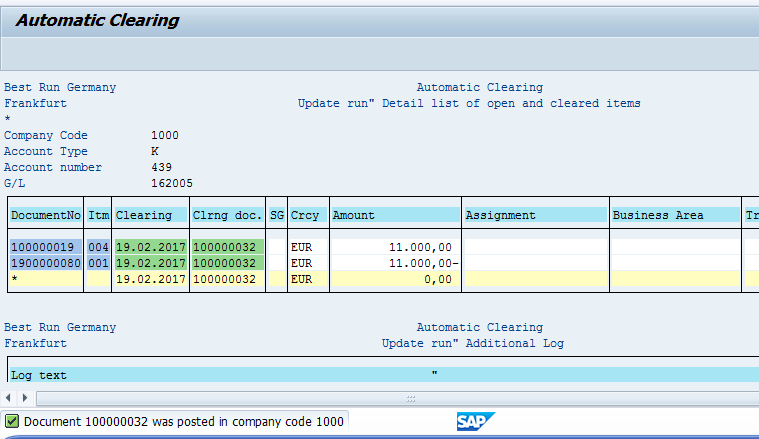 Clearing transactions always create SAP clearing documents. Posting with clearing is applicable for General Ledger (G/L), Accounts Receivables (A/R) and Accounts Payable (A/P) open items. Posting with clearing can be performed for several accounts and currencies simultaneously and using the automatic clearing program. Account clearing can be exemplified through manually clearing of an open invoice with a related credit memo and payment on account. 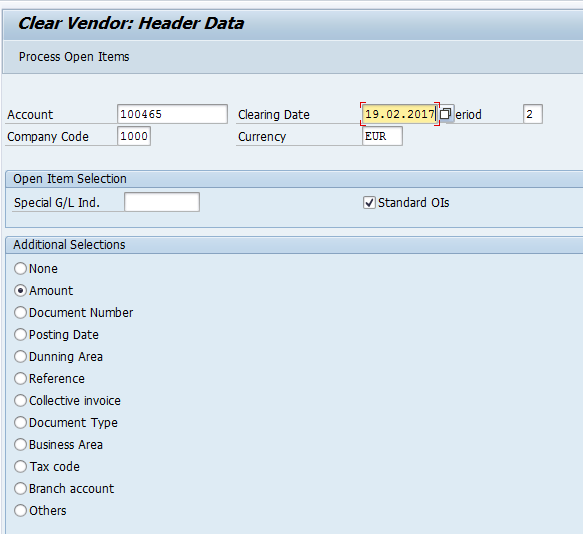 In SAP ERP, the status of documents (cleared or not cleared) is distinguished by color marks. 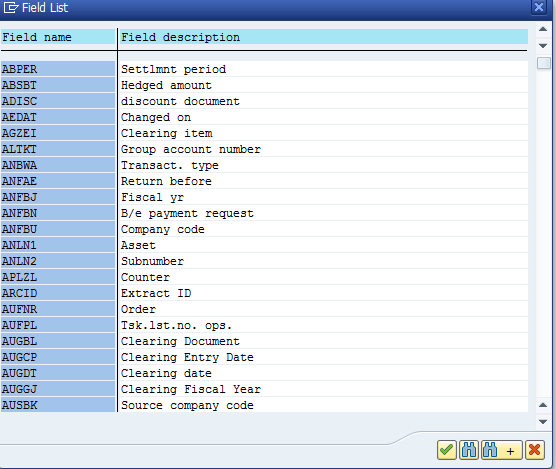 Not cleared documents (Open Items) are marked with a red circle in the Status column as show below. Cleared Items are marked with a green square in the Status column as shown below. Or directly start the transaction FBL1N from the command field. Enter Vendor account number and Company code. And then, select Open items to view open items. 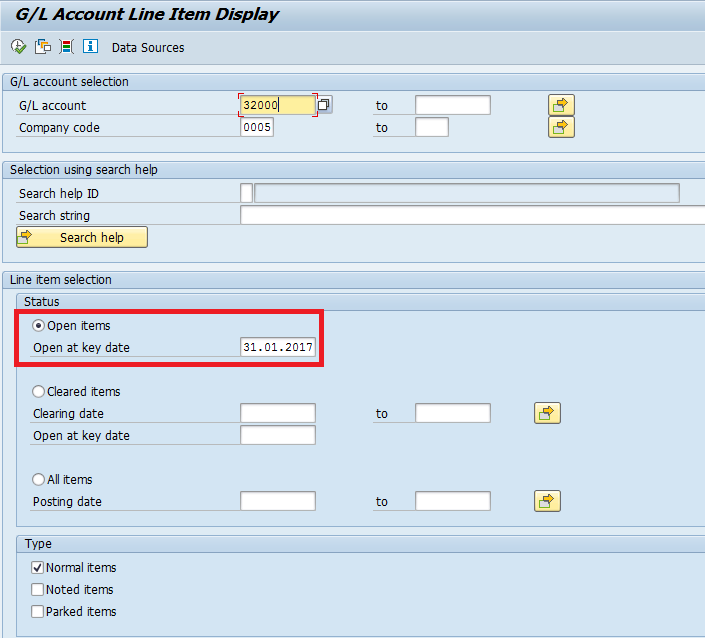 Input the key date for open items view. The transaction is displaying the Open Items marked with red in the Status column. There is no Clearing document for the moment, because this document will be cleared as per the date from Net due date column when the invoice will be paid. Or directly start the transaction FBL5N from the command field. Enter the Customer account number and Company code. Then, select Open items to view open items. Input the key date for open items view. The transaction is displaying the Open Items marked with red in the Status column. 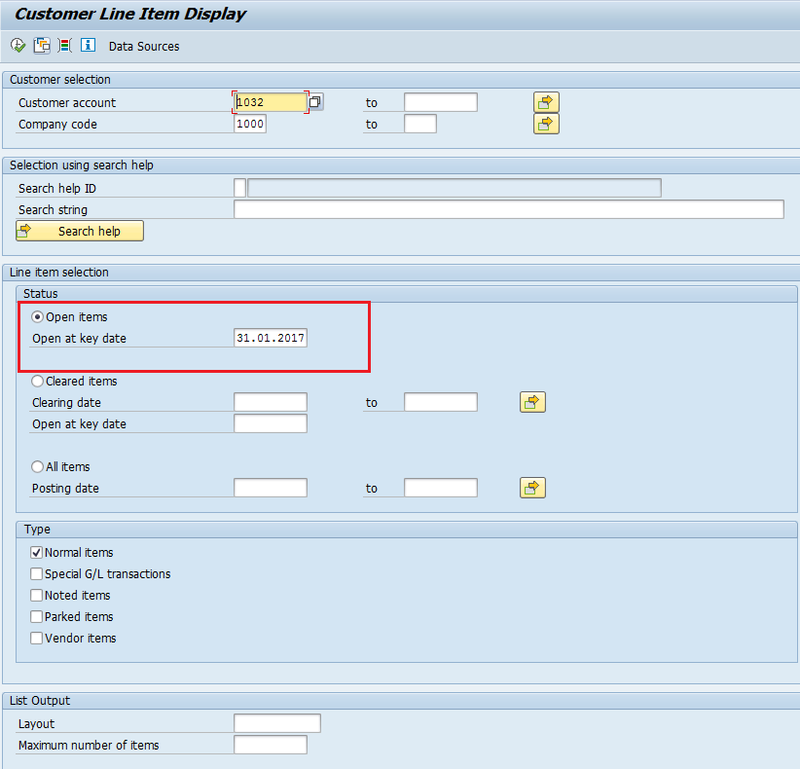 There is no Clearing document for the moment because this document will be cleared as per the date from Net due date column when the payment from the customer will be received. Or directly start the transaction FBL3N from the command field. Enter the G/L Account number and Company code. And then, select Open items to view open items. Input the key date for open items view. 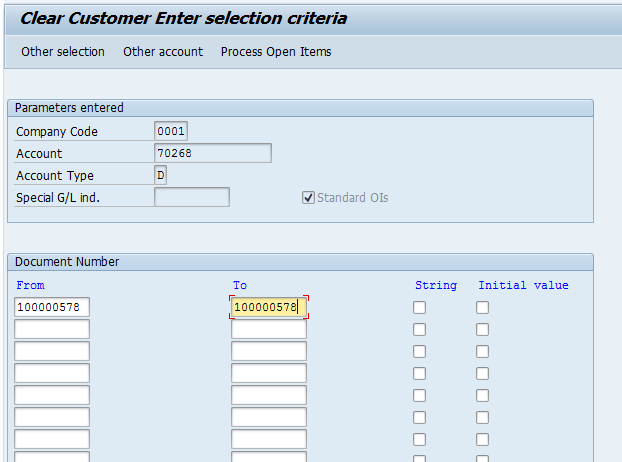 The criteria can be specified for each account type based on a single account or an interval of accounts. You use these criteria to restrict the number of items that are considered to be grouped together. This ensures that only those items that are related to the same business transaction are cleared together. 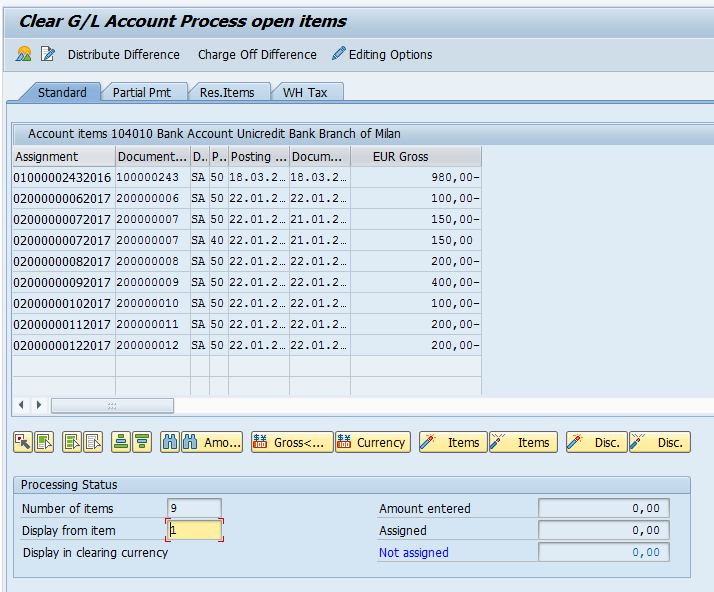 If balance in local currency of grouped open items is 0, then the SAP system automatically clears them and creates a clearing document. 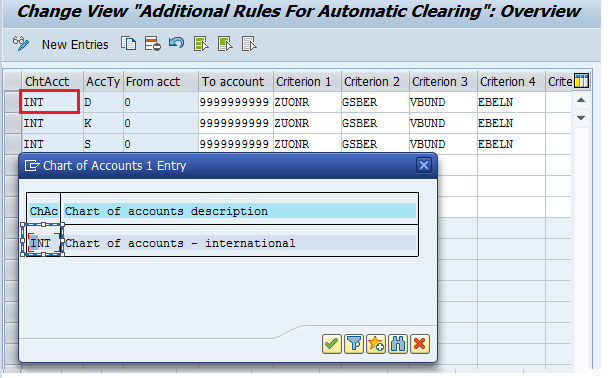 First criteria: define the accounts type to be cleared automatically (Customers, Vendors and G/L accounts). 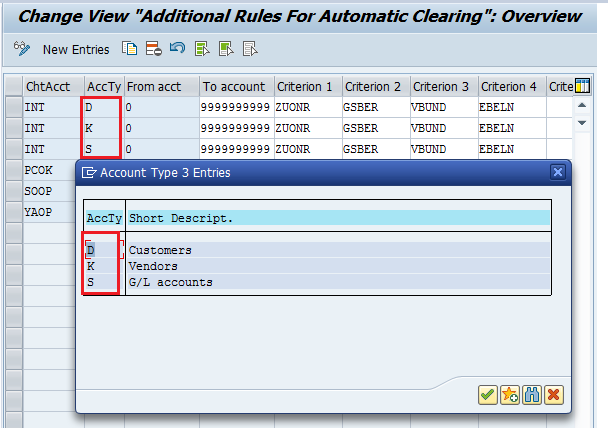 Second criteria: define the range numbers to be cleared automatically from each account type. Other criteria (max 5): choose from the list below. In the present example, the criteria used are assignment, business area, trading partner, and purchasing document. 1. 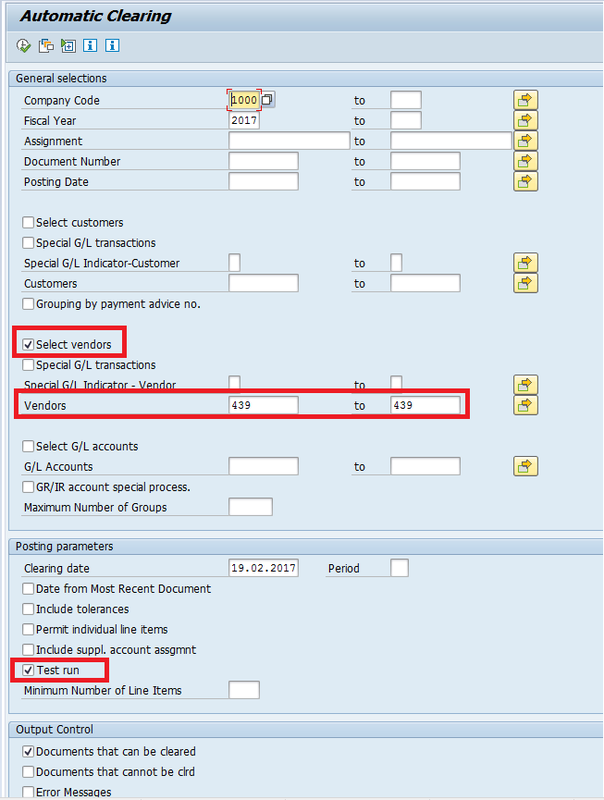 Enter the vendor account number in the vendor field in the control section of the general data in the customer master record. (transaction FD02). 2. 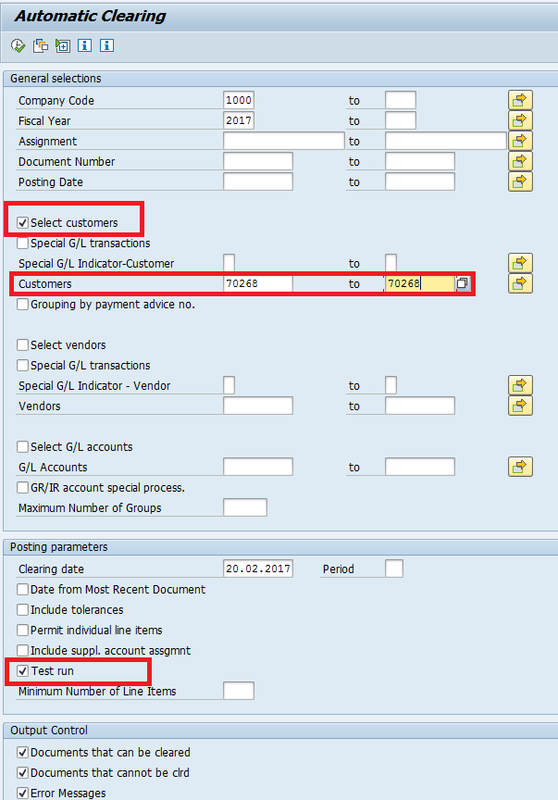 Enter the customer account number in the customer field in the control section of the general data in the vendor master record (transaction FK02). 3. Choose “Clrg with vend” and “Clrg with cust” in the company code data section in both the customer and the vendor master records. Below is detailed illustration of the setup for vendor clearing with customer. Or directly start the transaction FK02. 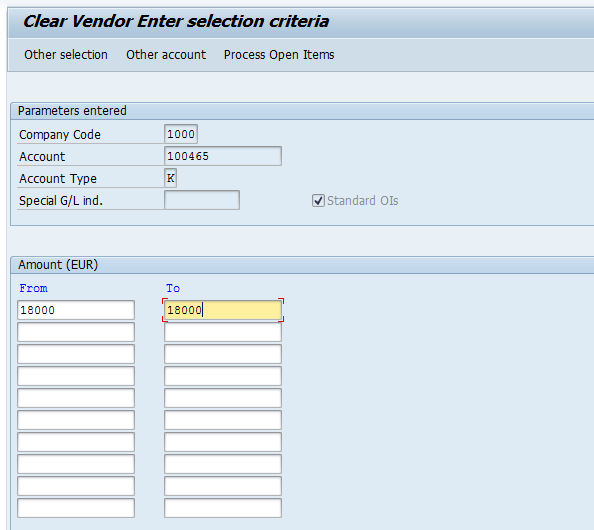 Input the vendor account number, the company code, and click Enter button on the keyboard. In tab “Account Control”, enter the customer number as shown below. In the tab “Payment transactions”, select the “Clrg with Cust.” checkbox. Or directly start the transaction FD02. Input the customer account number and the company code. 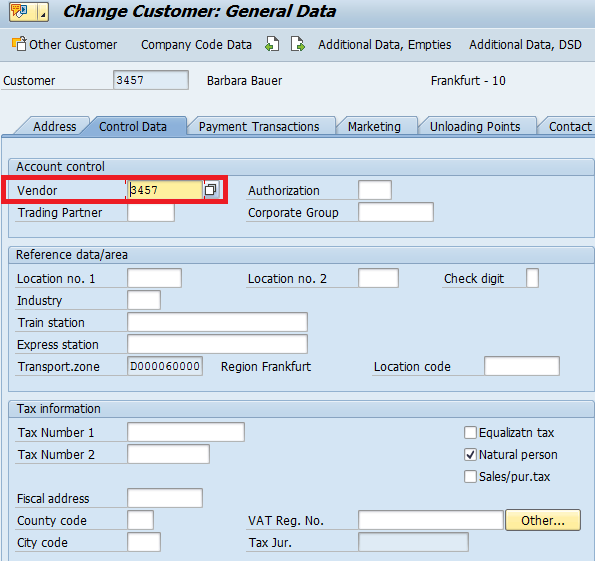 In the tab “Control Data”, enter the corresponding vendor number. 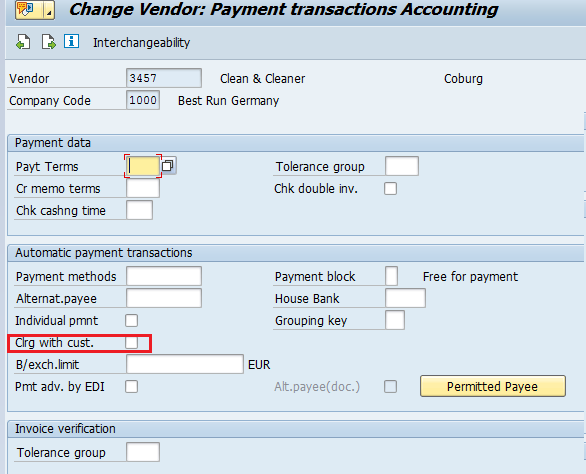 In the tab “Payment transactions”, select the “Clrg with vendor.” checkbox. 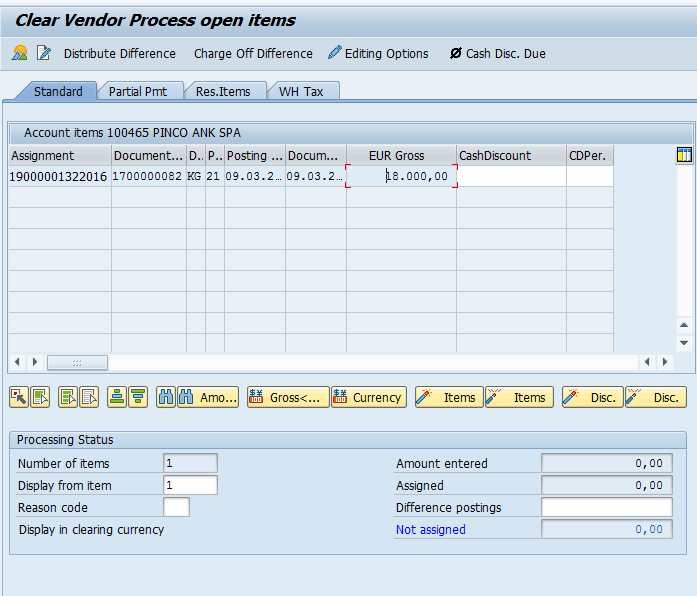 This transaction clears A/P, A/R and G/L open items based on the selection on the initial screen. You need to specify Company Code, Fiscal Year, tick Select vendors checkbox, enter vendor account numbers be cleared, and Clearing date. Next, select Test run checkbox in order to have a preview of the proposed items to be cleared. After checking that there is no mistakes, you will untick it for the final run. To run the transaction click Execute button. The SAP system will take you the next screen of the transaction and generate a list of the documents that are proposed by the system to be cleared. Since there is no errors, we can run the automatic clearing in normal mode. For the final run go back to the initial screen, remove Test run tick selection and click Execute button. 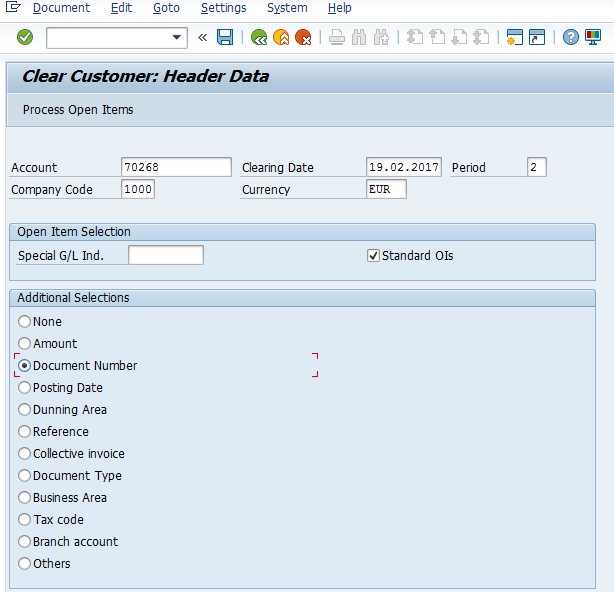 The SAP system will perform clearing and show the confirmation of the clearing posting with the generated clearing document number. You need to specify Company Code, Fiscal Year, tick Select G/L accounts checkbox to be cleared, enter G/L accounts numbers, and Clearing date on the initial screen. Next, select Test run checkbox in order to have a preview of the proposed items to be cleared. After checking that there is no mistakes, you will untick it for the final run. You need to specify Company Code, Fiscal Year, tick Select customers checkbox to be cleared, enter customers accounts numbers, and Clearing date on the initial screen. Next, select Test run checkbox in order to have a preview of the proposed items to be cleared. After checking that there is no mistakes, you will untick it for the final run. The difference between this F.13E transaction and the regular F.13 transaction is on the initial screen where a specific currency for the documents to be cleared can be entered as shown below. Now, let’s discuss how to perform clearing manually. After entering selection criteria on the initial screen (Account, Company Code, Clearing Date, and Additional Selection criteria if needed), execute the transaction by using Process Open Items button. Next step is to assign the documents to be cleared by double clicking on each of them. We can go further to process the clearing only if the field Not assigned shows that the items assigned to be cleared are balanced to 0. Before to save the results of clearing, we can simulate the clearing results using this button . Next, click on Save button and the confirmation of the document posting resulting from the clearing action will appear at the bottom of the screen. The first step is to enter the selection criteria (Account, Company Code, Clearing Date, and Period), mention if the clearing will refer to special G/L transactions (e.g., down payments), and if it will include standard open items accounts. An additional selection Document Number is used for more rapid selection of the documents. To proceed with the clearing process, click Process Open Items button. 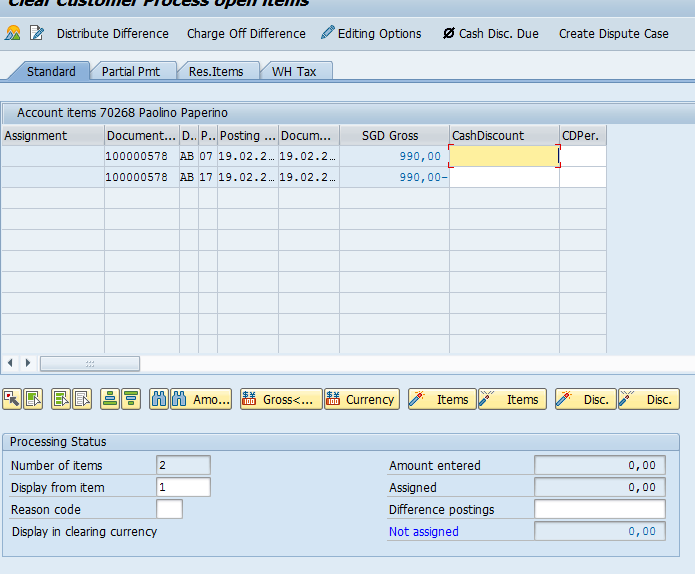 The SAP system will show a screen where you will need to specify the additional criteria for document numbers. We will enter the document numbers that FBL5N transaction showed us. 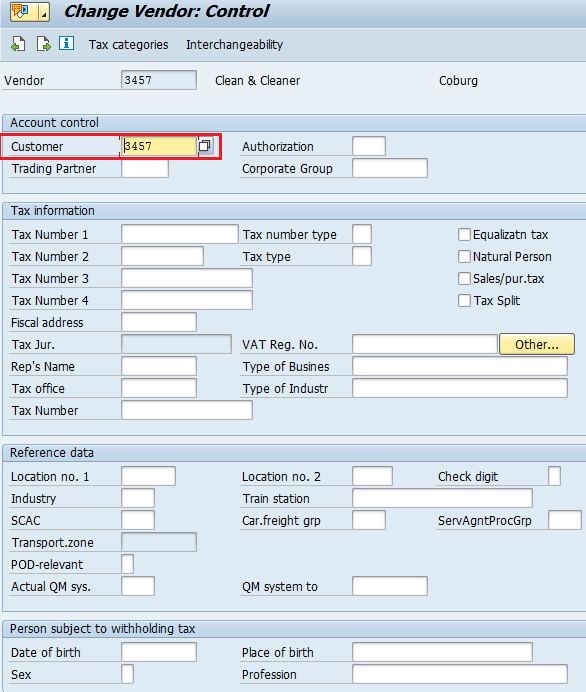 On the next screen, select the open items to be cleared by double clicking on the lines and check that the Not assigned field is balanced to 0. Next, click on Save button to perform clearing. The system will confirm the posting by providing the clearing document number. The additional criteria Amount will be used to simplify the selection. To proceed with the clearing process, click Process Open Items button. Next, click on Save button to perform clearing. The system confirms the posting by providing the document number. 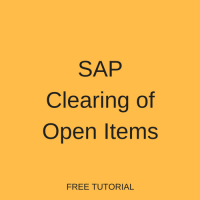 Excellent tutorial on the “Clearing of Open Items” in SAP Mihaela. Thank you for posting it! I’ve reviewed this topic before in several reference books and to be honest I never quite understood the process. Your documentation was very easy to follow. The detailed screenshots that you included in your tutorial will be very helpful. Really a good learning slide!!! Excellent. A clear explanation of the process of ” clearing open items” and excellent screehshots to show how it is performed in the system. Thank you ver y much guys, great job!! Hi thanks for this tutorial, very usefull ! I just have one quetion left : do we have the possibility to display a cleared transaction document ? We need to input here the clearing doc. no., the Co Cd and the year for clearing doc. Superb explanation, can understand easily. 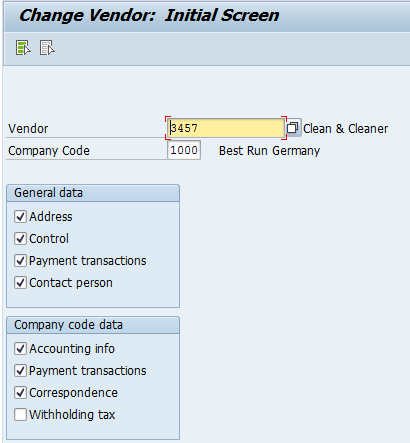 Is it possible to set auto clearing role for a vendor to a customer? Common field is REFERENCE same is for Customer and Vendor. can we clear a open item even we didn’t receive a payment from customer? or why we need to clear a document? what effect will have after clearing GL document? 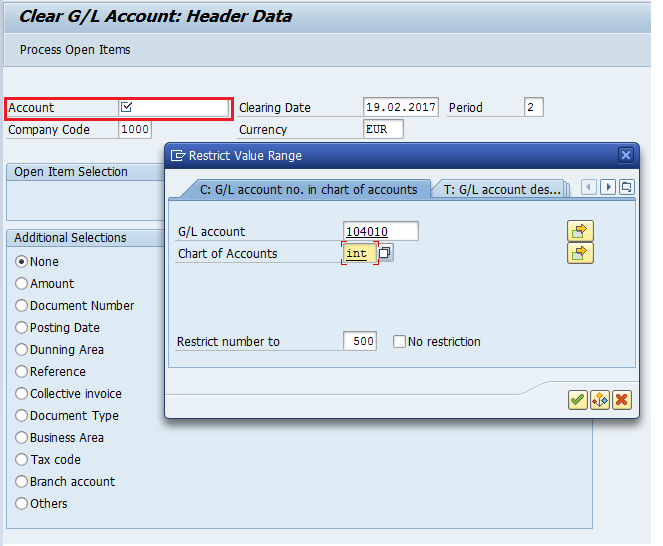 I want clear GL account with 2 selections (at the same time):Profit Center and document No . How can I do that? Many thanks . With classic accounting, you can see the entries below for accounts receivable. I understand making an entry also in the subsidiary ledger. My question, you describe a/p with “invoice posting” and “vendor account” and “generate open item.” The SAP thought process is a bit strange to me. Can you redo the matrix on section 1 with classic accounting entries? For both a/p and a/r? What account would you use instead of Invoice Posting for instance? for closing open items with a payment? 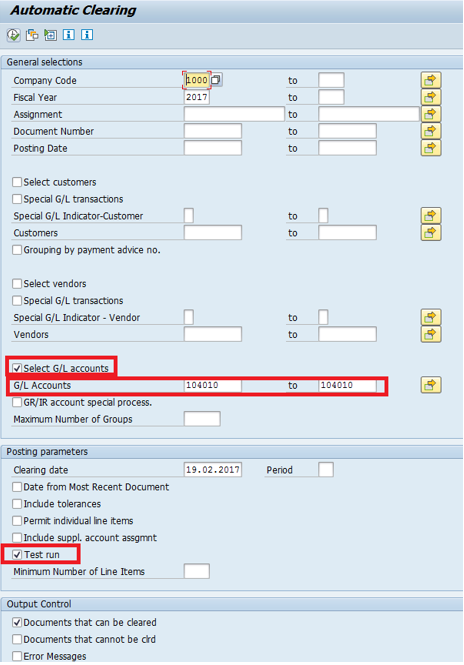 The manual clearing assumes that we have an invoice posted as per step 1 on Vendor as open item; meanwhile the payment is made and posted as per step 2. In this moment we have 2 open items on the Vendor. The clearing process is matching the Debit with the Credit and clears the balance on the Vendor Acct, in the same time closing the open items in the sub ledger. This is happening in the case of payment value matching the invoice value. In the other case when the payment has a different value then the invoice, let’s say invoice is 100 and payment made from bank account to that Vendor is 200, we will clear the invoice fully (so no open items on the credit side), but we will keep a new open item of 100 on the debit side representing the rest of the payment not matched yet with an invoice. Hi all. Thank you very much for working very hard and giving this very valuable document. I need your help. One of my client is using auto clearing process(F.13). While clearing through this, a document is being generated for every transaction getting cleared with document type AB(Accounting Document). All those AB documents were having the line items again. To which GL they are doing auto clearing, the same GL is getting debited and credited with the same amount. The net effect on of the transaction is zero but while giving a report to the HQ, they are questioning that why there are many transactions happened and debit and credit balance (individually) increased(net effect is zero). This should not happen for auto clearing. Why it is happening. I have the same question in terms of the detail line item postings created for auto clearing. Did you ever get a response? How can we check if a document is automatically or manually cleared? It helps a lot!! thank you so much for your effort! Really very good explanations….with a detailed screen shot..
you could have given some more explanation on the OB74 screen and about the criterion with examples. Still it is a good one. I was wondering is it possible to deactivate the automatic 0 balance matching somehow? I have some customer accounts with very high invoice volume, more than 1000 invoices monthly. It is time consuming to reconcile the payments, because customers do not match the credit notes always with the same invoice as the automatic clearing. Hi. Need your help please. We have special GL account that cannot be cleared by f.13 clearing. This is AP Process. IT says its because the system is clearing by amount not by Item. This was because there is a slight difference on the amount. However, we argue because on other GL account we have, Items with slight diff. on amount were cleared. Also, they said the system is clearing on FIFO basis. For ex., there is perfectly matching GR and IR on Line 20. However, GR was created first on Line 10. The systems cleared the GR of Line 10. The GR of line 20 was left open. Is there anything we should configure on the system? please advise.thank you in advance. My apologies if this question has been asked, I scrolled, but did not see it – this is in reference to clearing vendor items: I have a few instances where line items are displayed in ‘List of Vendor Line Items’, but when I go to manually clear them w/ F-44 they are not reflected. Any insight on to why this is, and how to remedy? Some of these line items go back a year, but I’ve been unable to clear them. If I clear items in a GL back to that GL with a net zero balance. I receive a document number, is there a way to retrieve all of the detail for the items that were cleared? We have been clearing the documents and now are not sure what items make up the entry. FB03 – display the document. Then Environment > Payment Usage will list the documents cleared by that clearing doc. Can you tell, is there any way to clear multiple vendors in F-44? Hello, while you have selected your first supplier, just click in the menu EDIT on SELECT MORE and then select the second supplier number. We have a freight clearing account with local currency of CAD. Depending upon the currency that the transportation vendor wants to be paid in we have transactions posting in both CAD and USD. Is it possible to clear the USD transactions using F13E? Does anyone know how could I see more clearing documents for more display documents? E.g. With FB03 I can see more invoices with clearing documents but invisible in layout and i need to see all this clearing documents for reset once and not one by one. 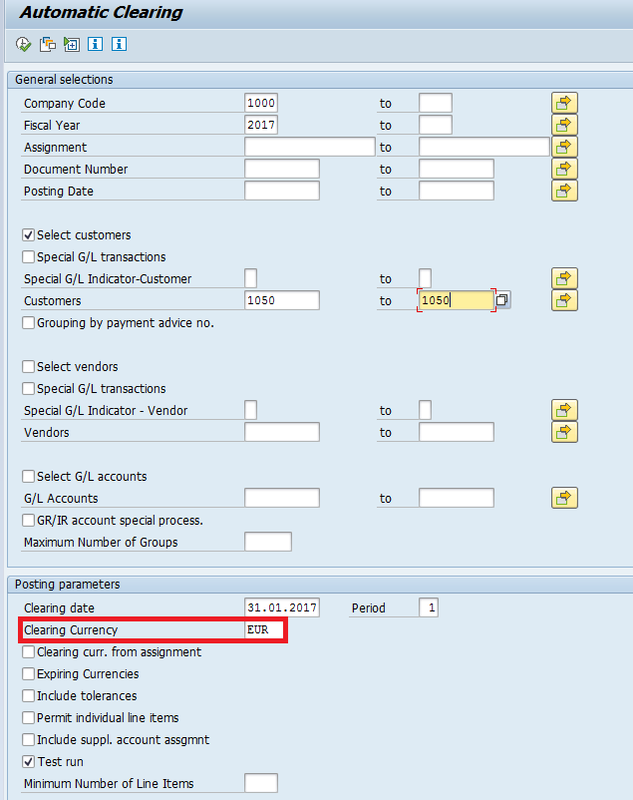 Hello – when manually clearing in the gl I know that there is a way of putting the debit value against the matching credit value that has been posted. I used it several years ago but cannot remember – its something like F6 then F3 – not those but that’s what I mean. This then used to put all the debits and credits next to each other and made clearing so much easier than clicking all the way through. Can someone tell me what the keys are that I need to press? Hello, what about automatic clearing with FIFO method? It’s possible ?